The purpose of our Society is to promote activities which are unique to the Welsh culture, and to support efforts to preserve contributions made by Welsh-Americans in the development of this area. Membership is open to persons of Welsh heritage and also those interested in Welsh culture. Our Executive Committee oversees the activities of our Society. Perhaps one of these Welsh names belongs to you or a member of your family. If not, you must know at least one person with such a name. Chances are, with a name like those above, there is some Welsh in the family. There are many beautiful flowers in Wales but the yellow daffodil, associated with St. David, is the Welsh national flower. Our logo provides a look remindful of a stained glass window for the Church historically and in preservation efforts. The Celtic medallion, at the bottom, ties the old country to the new and the background of hills and valleys in central New York are reminiscent of those in Wales. The Welsh language is a member of the Celtic branch of the Indo-European language family. It was the ordinary spoken language of the people of Britain before the Roman occupation and during the 400 years of that occupation. Even as it is spoken today, Welsh could probably be fairly well understood by the Britons who fought against Julius Caesar in the year 55 B.C. St. David, the Patron Saint of the Welsh, was born in Pembrokeshire, Wales, in the year 520. He was the son of the Prince of Ceredigion and the grandson of Prince Ceredig, of the Royal House of Gwynedd. He was ordained a priest after study in Aberaeron in the present County of Cardigan. With his friends and disciples he founded several monasteries in South Wales, with his final choice of settlement being a site in a steep-sided river valley near the sea. Here he founded the monastery that flourished in the centuries after his death as the Seat of a Bishop, a Center of Piety and Latin Learning. Today, the Cathedral of St. David, in the village of that name, attracts pilgrims from around the world each year. In the year 1120, he was Canonized by Pope Calixtus II, who decreed that two pilgrimages to St. David's Shrine would equate to one journey to Rome. John Adams, William Floyd, Robert Morris and fourteen other Signers of the Declaration of Independence. Thomas Jefferson, James Monroe, Abraham Lincoln and eight other Presidents of the United States. Charles Evans Hughes and two other U.S. Supreme Court Justices. William Penn, founder of Pennsylvania. Comedian Bob Hope; Harold Lloyd, silent screen actor, actors Richard Burton and Anthony Hopkins, singer Tom Jones; Catherine Zeta Jones, actress. Society sponsored programs include the Annual Dinner Meeting/Election of Officers in April, St. David's Day Banquet and Presentation of the Welsh Person of the Year Award in March; the Spring Gymanfa Ganu in May; the Welsh booth at the Remsen Festival of the Arts in September, the fall Gymanfa Ganu in October. The Society also sponsors musical groups from Wales, including outstanding choirs, that are on tour in the U.S. and provides scholarships to worthy young men and women for college study. The Society also encourages participation in other Welsh related activities and programs in our area. These include special July and August services at the Historic Bethel Church; May, July and September services at the Enlli Church; and July services at French Road Church ...all in nearby Remsen, N.Y. Members also participate in Remsen-Steuben historical society programs at Historic Capel Cerrig (Old Stone Church) in Remsen. The annual Gymanfa Ganu at Welsh Church in Nelson, and the annual Remsen Gymanfa Ganu are well attended by Society members. Revered by the ancient Egyptians as a symbol of the universe and prized by the Romans as an emblem of virtue, the Leek reached its true apotheosis in Wales. Celebrated as one of its national emblems, the Leek is worn by the Welsh Guards and the Prince of Wales. In the Battle of Heathfield in the 7th century, Welsh troops wore Leeks in their helmets to distinguish them from their enemies. The Druids, ancient priests, spoke of a heaven-sent dragon which would lead the nation in its struggle to perpetuate Welsh language and culture. This dragon was also associated with Calwaladr, called the last King of the Britons, who fought the Saxon forces in the 7th century. Eight centuries later, Henry Tudor marched under a "fiery dragon" on his way to the Battle of Bosworth where he defeated Richard III and was crowned King Henry Vii. Y Ddraig Goch is recognized as the Badge of Wales and appears on the Arms of the Prince of Wales. In 1953, it became the authorized National flag of Wales. The famous historian, Geraldus of Cambresis visited Wales in the year 1188 and wrote of the unique Welsh skill in vocal music, which they sang in "parts" rather than in unison. This skill and custom, developed through the ages, finds ifs expression today in the Gymanfa Ganu or Festival of Sacred Song. During the early days of the Colonies, there was, relatively speaking, a flood of emigrants from Wales. Some 40,000 settled in Massachusetts, Maryland, Virginia, Delaware and the Carolinas between 1620 and 1640. Others came in large numbers to Vermont, Wisconsin and New York. Welsh heritage in New York dates from the late 1700's to the mid 18OO's, when Oneida County could claim the largest concentration of Welsh settlers in America. The main areas of settlement were Utica, Steuben and Remsen. After the Revolutionary War, land was granted to Major General Baron von Steuben by a grateful government. This land, 16,000 acres in the town of Steuben, was divided into 100-acre plots and sold to the newly-arrived Welsh settlers. In these early days, Welsh families came together to keep alive their cultural traditions, maintain friendships and honor their Patron Saint, St. David. Two of the earliest groups were the Welsh Society of Philadelphia, founded in 1729 and the St. David's Society of New York State in 1835. The St. David's Society of Utica can trace its roots to the Cymreigyddion Society's Eisteddfod in 1856. St David's Day, as celebrated today, dates back to 1120, when Dewi (David) was canonised by Pope Callactus the Second, and March 1st was included in the Church calendar. Each year, throughout the world, wherever Welsh families can foregather, St. David's death is commemorated on March 1st. Locally, St. David's Society members and friends honor this event with the Annual St. David's Day Banquet, held on March 1st, or the Sunday immediately preceding that date. The author of the words of this Song and Chorus, Evan James -- known also by his bardic name "Ieuan ab Iago" (Evan the son of James) -- was a weaver by trade, who was born in Caerphilly in South Wales in 1809, and died in the neighboring town of Pontypridd in 1878. The music was written by his son, James James, who was then landlord of an inn called the Welsh Harp in Pontypridd, and who could play the harp himself. The piece was first published in the first number of Owen's "Gems of Welsh Melody", 1860, the English words (in addition to another set), "with symphonies, accompaniments, and chorus," being by the editor. It is now, and has been for some time, recognised generally as the Welsh National Anthem. Cream margarine with sugar, add eggs, beat well. Add dry ingredients and milk. Roll on floured board, approx 1/4" thick. Bake on electric fry pan at 300 for about 5 minutes each side. Sprinkle with sugar while cooling. Mix dried fruit and sugar together and pour warm, milkless tea over and let stand overnight or for several hours until the fruit is swollen up. The next day, stir in the flour, spice, marmalade and finally the well-beaten egg. Line a loaf tin (4’x7”) with greased paper, put the mixture in and bake in a moderate oven (325˚) for 1 ¾ hours. Turn out onto a wire rack when cooked and brush with warm honey to glaze. When cold, slice thinly and spread with butter. *This recipe is believed to have been handed down originally from Mrs. Moir, of the Lake Vyrnwy Hotel. Most recently is has been revived by Barbara Credle of Remsen, New York who serves it at the summer service at French Road Church. 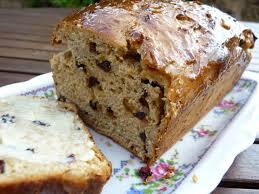 Barbara reminds us that no “Capel Tea” is complete without a plate of Bara Brith. The St. David's Society of Utica, New York offers scholarships to students pursuing post secondary education through college or university degree programs or through specialized secondary education such as technical schools. Applicants must be a member of the Society or relative of the immediate family (Parent, Grandparent, Brother, Sister) of a member of the Society for the past two years. Scholarships awarded are for the coming school year. The scholarship application form has been revised, and is available as a downloadable (MS Word format) document. Please refer to our Scholarship page for details.